Abstract: The Ethernet connection is powered by a 3Com 910-A01 10/100 integrated NIC. Albatron have in just a short time, made their mark among enthusiasts and overclockers for producing high quality computer components. 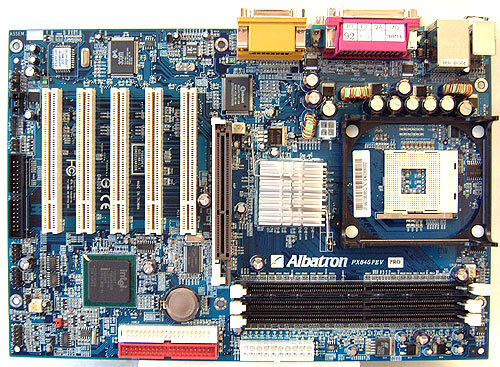 In this article we will be reviewing the relatively new Albatron PX845PEV Pro i845PE based motherboard. The Intel i845PE chipset officially brings DDR333 support to the table, and if you are lucky enough to be able to afford a new 3.06GHz processor, Hyper-threading support. In the end, the real question remains; just how well does the PX845PEV Pro stack up against against the competition? Showing itself off with a slick blue-coloured PCB that case modders can really appreciate, the PX845PEV Pro is a rather slim motherboard in size. Don't let that distract you though, the board has quite a few on board features. The PX845PEV is built around the i845PE chipset, and comes with three DDR DIMM slots which support up to 2 GB of PC1600/2100/2700 DDR RAM. Acoustically, Albatron have opted to equip the board with on board 5.1 channel audio as most other manufacturers do, but it is based on the AC'97 codec only. A 10/100 Ethernet connection makes the need to buy a NIC card a thing of the past, though the placement right next to the PS/2 ports may be a bit troublesome. The Ethernet connection is powered by a 3Com 910-A01 10/100 integrated NIC. 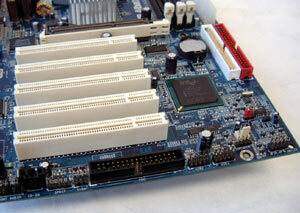 With a full set of five PCI expansion slots, and AGP slot there is little room for anything else on this PCB, including IDE RAID or Serial ATA. Even though I knew the motherboard used a smaller sized PCB than usual, it was still surprising to see that a GeForce4 Ti4600 videocard is actually longer than the the PX845PEV is wide. By about 1.5cm in fact! The main ATX power connector is in a good location to the right of the DIMM slots, however the secondary P4 power connector is located a little too close to the processor itself. All and all, the rest of the board layout is pretty good, and the small size of the PCB will make it easy to install in cramped cases. Albatron use a newer type of AGP sliding lock to secure those several-hundered-dollar videocards in place. The sliding lock seems to be much better than the older lever type AGP lock, and it's easier to engage. With the videocard locked in, it won't accidentally come loose in the socket while the power is on. The fan headers, of which there are three, are all in good locations and easily accessible. My biggest qualm with the motherboard surrounds the placement of the floppy drive connector. With it located at the very bottom of the motherboard, users with full tower cases like the Inwin Q500 will have big problems getting the drive and motherboard connected. The engineers involved in laying out the components on this board would have done well to place the FDD connector alongside the IDE connectors. As a consumer there isn't anything to be done about this, but if you have a large case you should know the possible limitations. Albatron took a step in the right direction with on board networking provided by a 3Com 910-A01 10/100 NIC. Or perhaps that's just my impressions of what 3Com ought to be bringing to the table. In the coming months it will be interesting to see how many manufacturers bring 10/100/1000 Ethernet to motherboards as an on board feature. The only manufacturer we know of who does this currently is MSI Computer. Pg 7. What is the final word?